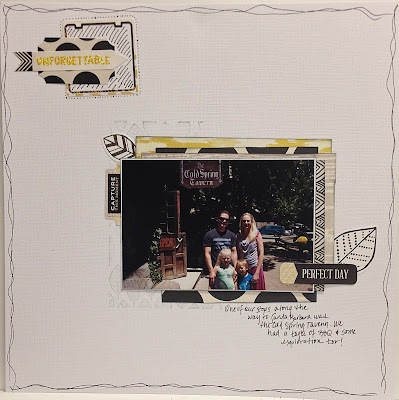 Today I want to share with you an altered item I created using Simple Stories So Fancy Line. It is this crown shaped wall hanging for my daughter's room. I picked up the paper mache shape at my local craft store. It only took my about 30 minutes to complete. It came together really quick. I first painted the edges pink and used the polka dot paper to cover the top. I added glitter to the edge. It helps cover up some of the imperfections in my cutting. Then I started embellishing until I was happy with it. I loved that [email protected] Card saying so I knew I wanted to use it somehow. I'm really happy with how it turned out. 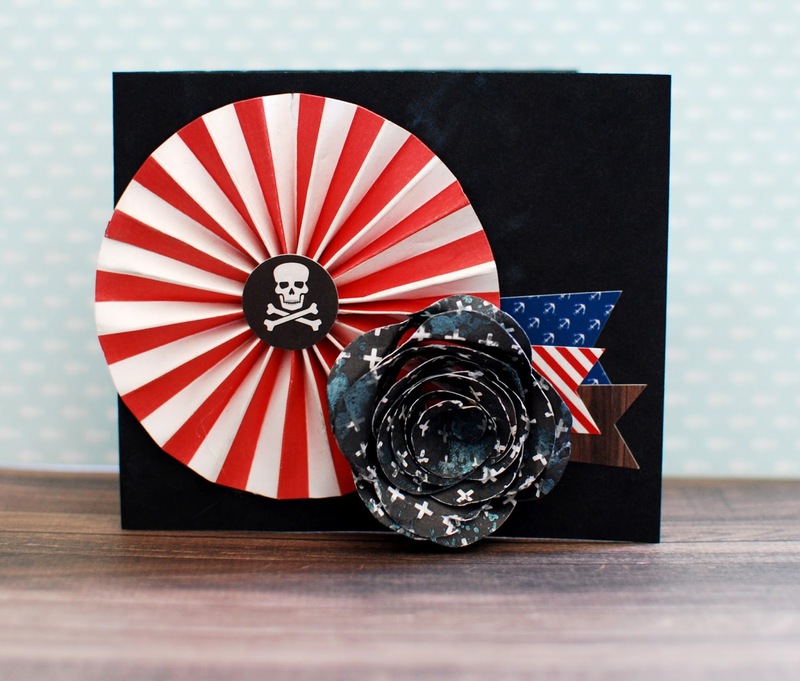 Here is a fun card I made today with the Pirate's Life Collection by Echo Park. A simple card with a few fun details. I girly'd it up a bit by adding a cute paper flower. 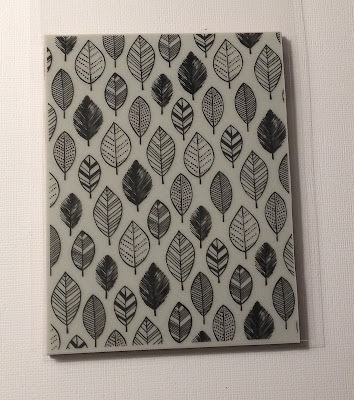 Basic Grey's "Tea Garden" Paper Collection by FotoBella is fast becoming one of my favorites! I just love all the beautiful colors in this collection! It reminds me of vintage handkerchiefs from the 1940's but with a modern twist! Hi bloggers! It's ReNae with the FotoBella Design Team! 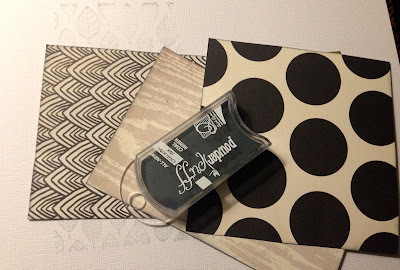 I am LOVING the TEA GARDEN Paper Collection Pack from Basic Grey and FotoBella! So today I decided to make a layered card using the bird journaling card. I created depth and dimension by popping up the banner stickers from the sticker sheet, and alpha stickers to create my own "fresh" banner sticker! Added some glitter and now the bird sparkles! This type of card would be great as an invitation to a summer birthday party or to celebrate friends! There are endless options with this wonderful collection! The collection pack has so much to work with...charms, stamps, and these gorgeous papers! 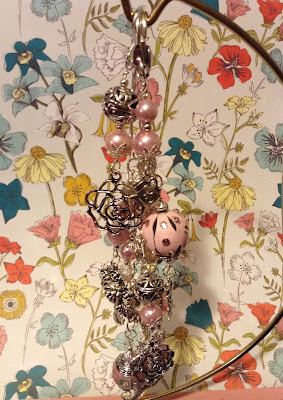 I have already made jewelry, charms, and cards with it so far, and I'm just getting started! great for hanging on your handbag or just by itself! 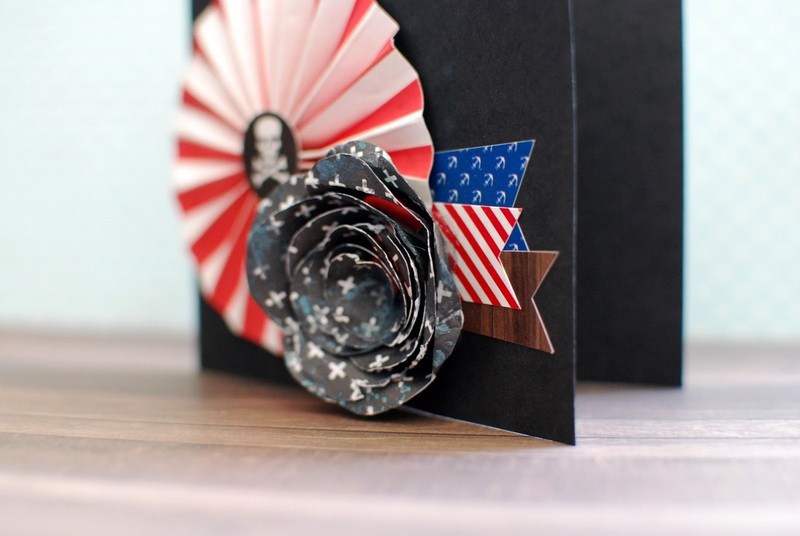 This elegant greeting card would make anyone's day! by Hero Arts with Basic Grey. In my next post we will be creating an amazing stamped card using these gorgeous floral images, so be sure to check back often! 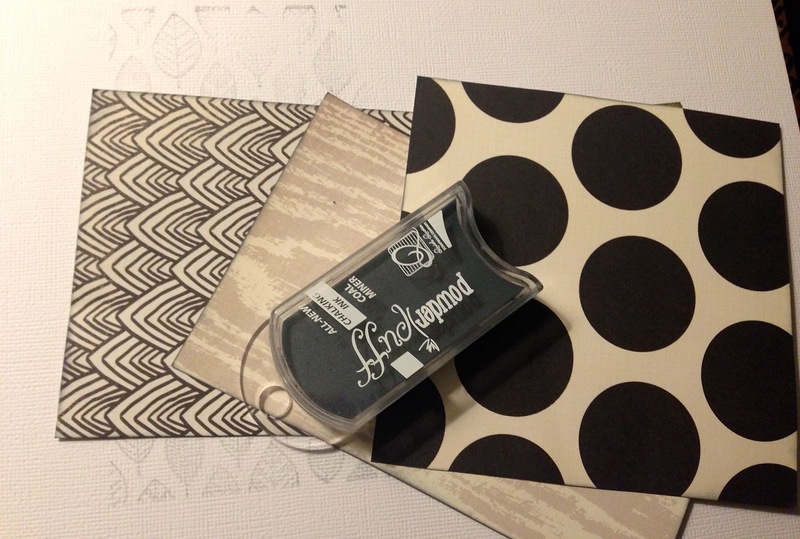 I will also be giving away one of these awesome stamp sets! 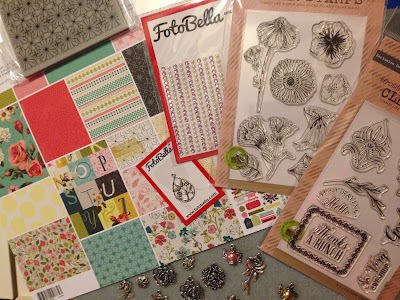 See what YOU can create with the TEA GARDEN Collection Pack from FotoBella! 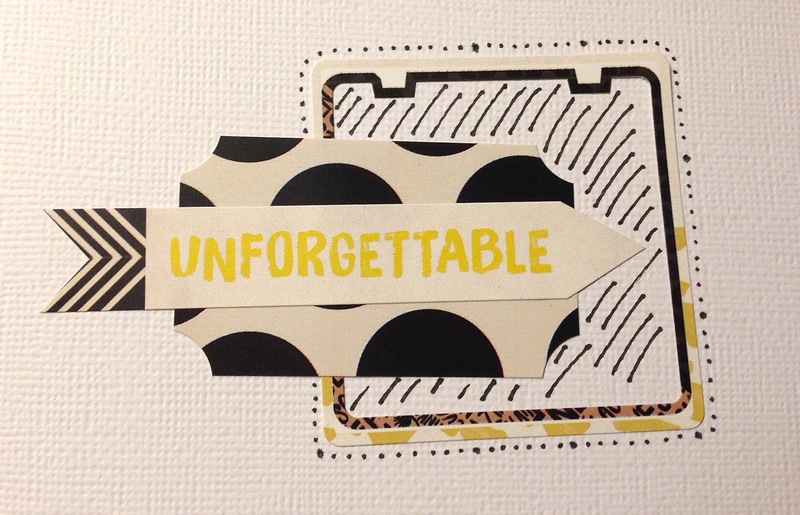 FotoBella is known for their amazing Paper Bundles, and this is no exception! Be sure to get one for yourself and join in on the fun! I was so excited when the Simple Stories So Fancy Line showed up on my doorstep. I had been eyeing it from time it was revealed. I knew I was going to have fun with my DT items for FotoBella this month. This is an older picture of my daughter and her two best friends. They are super silly together and now our families have all become friends. We have so much fun when we all get together. This paper doesn't really require a lot of extra embellishments. It has so much going that it makes it easy to use. I'm not normally a big gold fan, but I love the gold touches in this line. 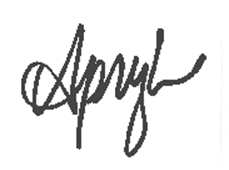 Hi there, it's Apryl with the design team here today to share a layout tutorial using Basic Grey's Barista I Want It All Bundle that features several techniques: stamping, doodling, layering and using Stickles. It's a fun layout to put together, so grab your bundle and let's get started. 1. Select the Graphic Leaves cling stamp to begin adding texture to the background of the layout. 2. Take your black ink pad and ink up the stamp. 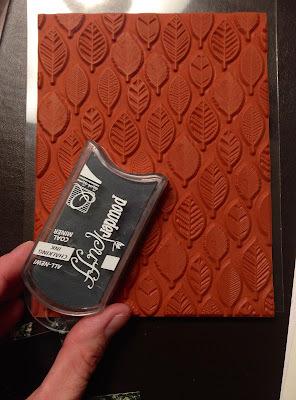 Do a light coat of ink so that you make a faded stamped look on the page. 3. Apply the stamp in the middle of the page slightly off to the left side. 4. Cut out a variety of rectangles measuring approximately 5 " x 6.5"from the papers: Chai side A & B, Journal paper side B and Tea. These will all be layered behind a 4’x6’ photo and don’t have to be be measured exactly, because they will be staggered. 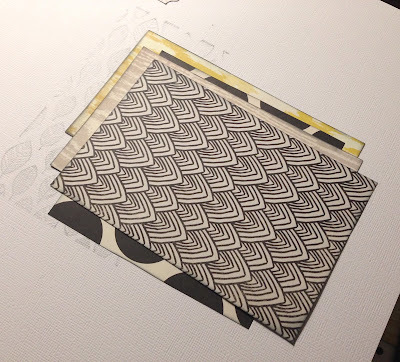 Ink all the edges with black ink. 5. Layer and stagger the rectangles you just cut out over the stamped leaf image to create a matte background for your photo. 6. 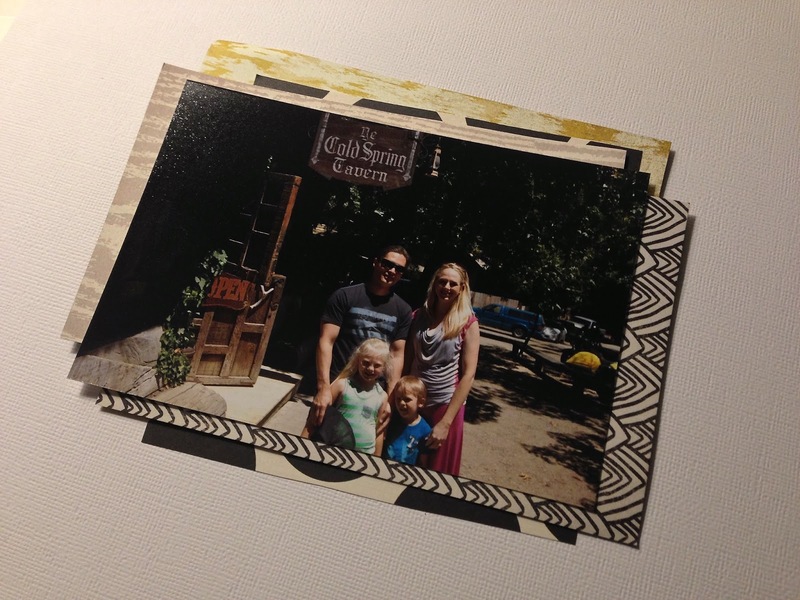 Place your 4x6 photo in the center of the layers. I chose to matte my photo with white cardstock for adhering it to the layered matte. 7. From the Title Stickers sheet, select the tab sticker and the sticker that says “ Capture This Moment”. 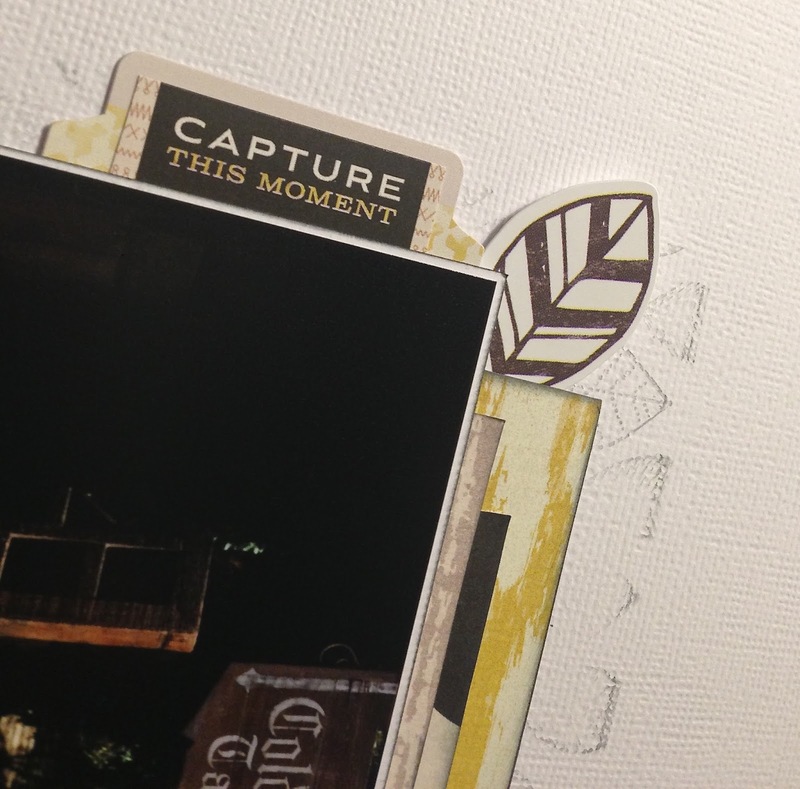 Trim the sides of the “Capture…”sticker so that it will fit on the tab sticker. 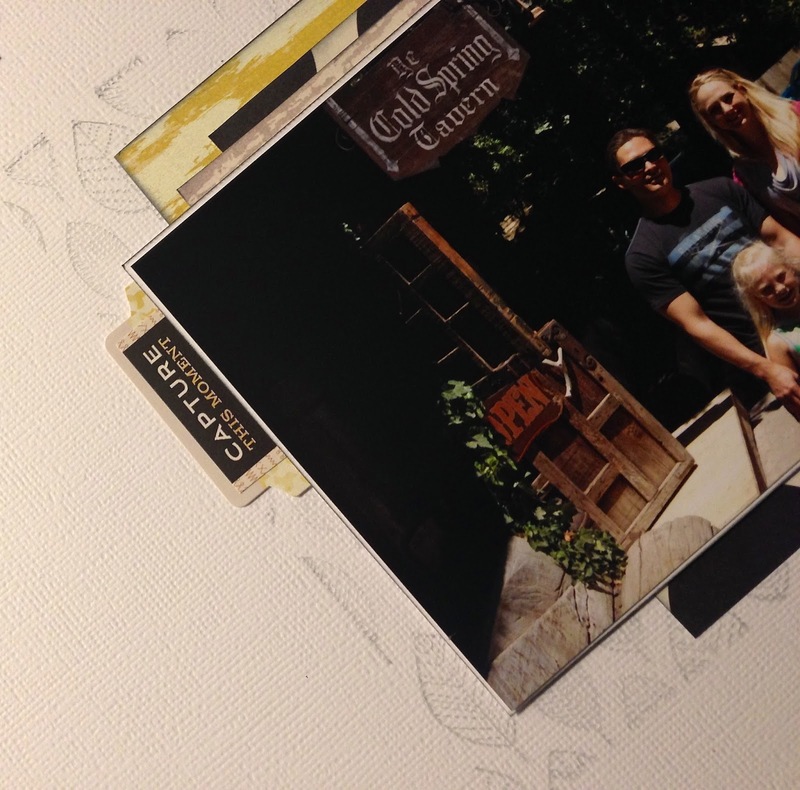 Layer the stickers and adhere vertically at the top left hand corner of the photo. 8. 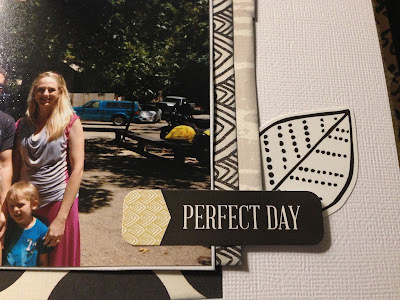 Choose the “Perfect Day” Sticker from the Titles Sticker sheet and place at the bottom right corner of the photo. 9. 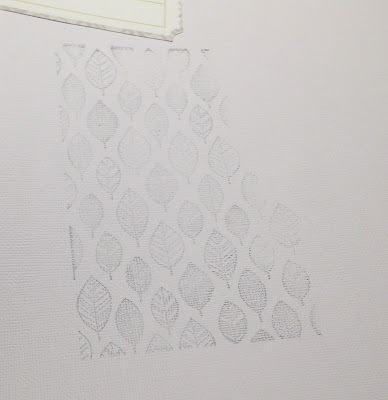 From the Elements Sticker sheet, select the leaf sticker with the solid lines and tuck it behind the layered papers at the top left hand corner. 10. From the Elements Sticker sheet, select the leaf sticker with the dotted line pattern and tuck behind the “Perfect Day” sticker at the bottom right corner of the photo. 11. Select the Element Sticker Sheet and choose the frame sticker shown in this photo and place it at the top left hand corner of the white cardstock. 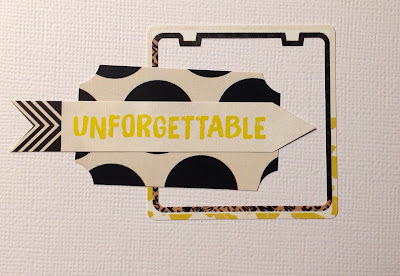 Layer the black & white polka dot ticket shaped ticket and layer it over the frame sticker, offset to the left. Then select the “Unforgettable” arrow sticker and layer it on top of the polka dot sticker. 12. 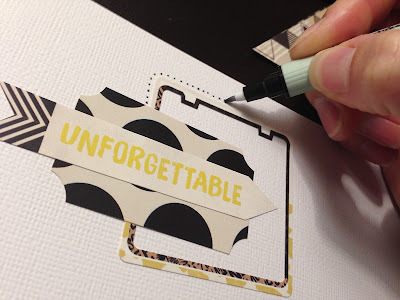 Using a black felt pen, add dots all along the outer edge of the frame sticker. 13. Inside the frame sticker, draw diagonal lines to fill the blank space. 14. 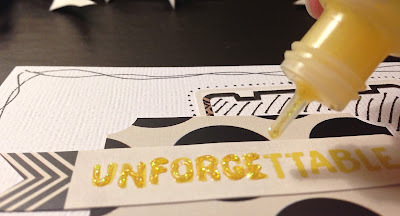 Using yellow Stickles, outline the letters of “Unforgettable”. 15. 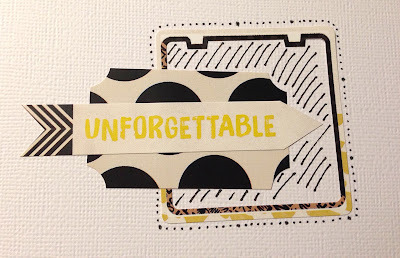 Use the black felt pen and draw lines around the edge of the cardstock a couple times to create a frame. And here's the completed layout. If you haven't bought the Barista I Want It All bundle, visit FotoBella.com right away!